Lightweight fabric, perfect for hot climates and of course workouts! NEW COLOUR! This gorgeous top is so simple yet so stylish, and is extremely versatile, hence why it is so popular with our customers. 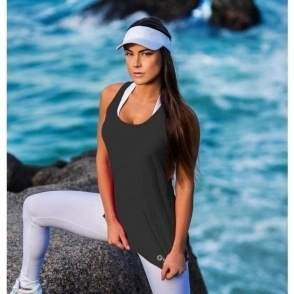 Perfect for those 'Lazy Days', or you can wear it for your favourite sport, whether it be yoga, running, tennis, or getting you to and from the gym! This lovely dip bum top is made from a very lightweight material that is silky soft and very stretchy.